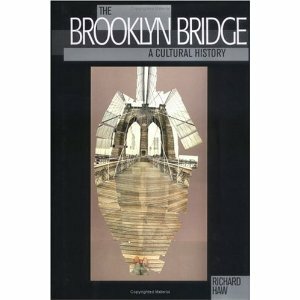 On May 13, 2010, Richard Haw, a professor at the City University of New York, shared his perspective about the historical evolution of the Brooklyn Bridge and current developments. 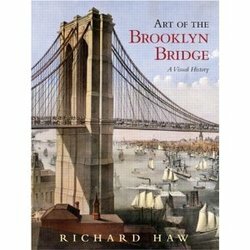 Professor Haw is the author of two books about the Brooklyn Bridge, The Brooklyn Bridge: A Cultural History and Art of the Brooklyn Bridge: A Visual History. Currently he is working on a biography of John and Washington Roebling. How has the influence of the Brooklyn Bridge on American society changed? When it was first created the Brooklyn Bridge was seen as such a giant leap forward in innovation. Similar to the Internet today, the bridge fundamentally affected everything. The Brooklyn Bridge was one of the tallest structures in the world. People were amazed by the bridge's enormous size as it towered over all of New York. It greatly effected transportation by allowing cargo to cross the East River more efficiently. Also, the bridge helped the population of Brooklyn to explode. Now there are much taller structures. The bridge no longer is the dominant structure over New York. It has gone from being viewed as powerful and massive to being seen as beautiful and loved for its elegant design. Today it blends into the city, but adds to the beauty of the New York skyline. It is a major tourist site. The bridge brings a sense of nostalgia. When it first was constructed people viewed it as a harbinger of the future. The Brooklyn Bridge was ahead of its time and to people represented the future. Now, the Brooklyn Bridge represents the past and where Americans came from. Americans take pride in the bridge. The Brooklyn Bridge began the modern transportation movement. Today we have subways and high tech transportation, but none are as beautiful as the Brooklyn Bridge. Unlike most bridges today, the Brooklyn Bridge was built for beauty and design, not just for utility. Have there been repairs, improvements, or other changes to the Brooklyn Bridge? When it was first built, horses and carriages travelled across the bridge. But, roads had to be strengthened eventually as automobiles were invented. The bridge used to have trains moving across it, and then trolleys. It is now just a highway. The bridge reminds you of how far we have progressed in technology. The cables were also replaced. The bridge used to have a beautiful curve, but it has been flattened. Some of it looks like a tunnel now. Before it used to be totally open. Railings were also erected on the sides of the bridge. However, the Brooklyn Bridge looks broadly the same from a distance. During the recent election there was a debate on whether America is doing enough to maintain its infrastructure. Despite America’s very impressive infrastructure, some believe that America does not adequately maintain its infrastructure. There are plans to repaint the Brooklyn Bridge in the near future. Repairs are also made to the roadway occasionally. Since its creation, have there been any major accidents on the Brooklyn Bridge? Have any changes been made to the bridge to improve safety? Yes, in the 1880s there was a “panic” on Memorial Day. There used to be stairs leading down the Manhattan side of the Brooklyn Bridge. 100,000 people were alarmed by some unknown reason. These people started running down the stairs as others were walking up. The pressure of the crowds pushing against each other caused many causalities. Today there are no longer stairs on the sides of the Brooklyn Bridge. There have also been many causalities due to cables snapping. The roadway of the bridge used to move and drop. But there have been vast improvements to prevent these safety hazards. One improvement allows the bridge to safely move and contract depending on the weather. The big cables used to be fixed or held into place. Now the cables are on rollers so that they can move with the weather. Since 9/11 have there been any increases in security on the bridge? Security increased on the bridge after 9/11. Directly following 9/11 you saw many heavily armed policemen on the bridge. In my second book, I talk about a few incidents of terrorism. There was a plot by a man to blow up the bridge, but the man was caught before any damage was caused. Also, there used to be an art show called “Art in the Anchorage”, which was located on the anchorage of the Manhattan side of the bridge. However, after 9/11 the show was shut down and they have yet to open it because it could be a potential way for a terrorist attack. You also used to be able to stand around the base of the towers on the Brooklyn side, but after 9/11 they were closed off. What single factor or part of the bridge impresses you most? There are several factors. If you asked me this question tomorrow I would probably say something completely different. The bridge is a really beautiful place. The appearance of many bridges today is dominated by traffic on the outsides of the bridge and those bridges just connect to a major highway. In contrast, the Brooklyn Bridge is elevated and is used to connect the two cities of Brooklyn and Manhattan. The Brooklyn Bridge itself is beautiful to look at. Bridges today are just built to get from one place to the other. People are not as concerned today with making bridges that are beautiful. My favorite part of the bridge I would have to say is the central walkway. The walkway is not affected by the traffic on the bridge. There is a lot of space to sit on a bench and there is a beautiful view. The central walkway allows you to get away from the city. It is a great place to reflect, think, hang out, and just enjoy yourself while overlooking the river. Thank You Professor Haw for taking the time to talk to me today. I’m sure that you insights will inspire many to visit the Brooklyn Bridge.